Homemade Cavatelli. Homemade Vodka Sauce, made with Homemade Marinara Sauce. That could have been dinner. We did not really need anything else. But I saw the Lyon Artichokes at Bishops, $2.99 each. I had to buy one. One was big enough for both of us with leftovers! But how to stuff it. I have been on quest for a recipe that mirrored what my Mom made. I have tried a few. Some I have posted others I have not. Well, this is it. I found it. When I got home with the massive artichoke I googled Lyon Artichoke. At the end of the informational site I found recipe links. I recognized one of the blog names as the same one I used for an Easter Pie. Food Blogga. The photo looked like what my Mom made so I tried the recipe. I was amazed. It was my Mom's recipe, well close to my Mom's. The instructions were simple and well presented. And the result was something I have been looking for for a long time. Chris was even amazed at how good the stuffing was. Thank you Susan Russo for your amazing blog. This artichoke was the perfect end to a perfect Saturday. 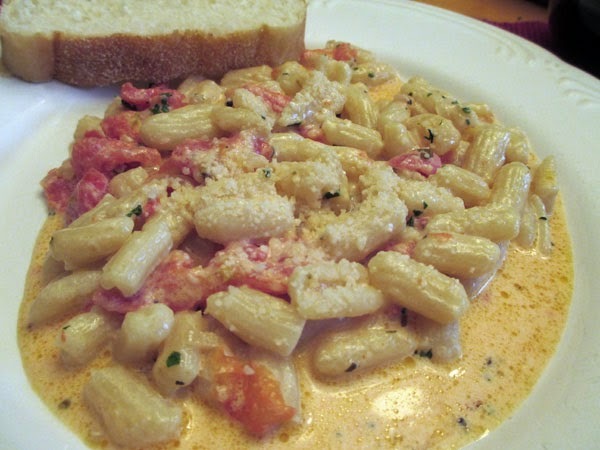 And the Cavatelli with Homemade Vodka Sauce was quite amazing too!